￼specializing in mature adults and adults with disabilities. All of her clients have a desire to lose weight and/or an eagerness to become strong and fit. She enjoys helping people reach their goals, whether it is climbing Mt. McKinley or losing 5lbs safely. Due to her background in Tae Kwon Do, Sandy likes to incorporate boxing and kicking into her clients’ workouts. She also uses functional training, helping the body learn to safely move in ways that mimic daily routine. “Changing things up” is one of Sandy’s mantras, keeping the muscles continually working in different ways for a better all-around result. 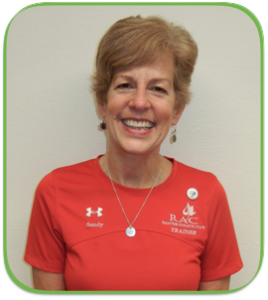 Sandy believes that nutrition, strength training and cardiovascular exercise are an integral part of living life to the fullest, no matter what your age or condition. She is known for her attention to detail, her connection with students and clients and her wide range of fun and invigorating workouts!